AMD raised cash and made progress in the cloud, setting the table for a better 2017. Advanced Micro Devices (NASDAQ:AMD) will report a net loss this year, making 2016 the fifth consecutive year that AMD has failed to turn a profit. 2017 is shaping up to be better for AMD, with the launch of its new Ryzen CPUs and high-end Vega GPUs on the horizon. The success of those products will determine whether AMD will return to profitability next year and beyond. AMD investors are no doubt looking forward to 2017, and the company made some good moves this year that have improved its chances of success. The balance sheet is stronger and its prospects are brighter thanks to AMD's best moves of 2016. At the end of the first quarter of 2016, AMD's balance sheet was looking stretched. The company's cash balance was barely above $700 million, near the low end of its target range, and debt topped $2.2 billion. Book value had plunged to negative $500 million thanks to years of losses. In April, AMD sold its semiconductor assembly and test assets into a joint venture with Nantong Fujitsu Microelectronics, retaining a 15% stake and receiving about $320 million in cash, net of taxes and other expenses. This deal provided AMD with some much-needed cash as it was preparing to launch Polaris, its mainstream-orientated GPU. Around the same time, AMD signed a deal with Tianjin Haiguang Advanced Technology Investment Co. to form another JV, this one focused on bringing x86 server SoCs to the Chinese server market. AMD licensed its high-performance processor and SoC technology to the JV, receiving a $293 million licensing payment with the potential for additional royalty payments in the future. These two deals greatly strengthened AMD's balance sheet, giving it the necessary resources to forge ahead with its turnaround plan. Shares of AMD have soared this year, driven higher by optimism that the company's new products will drive revenue and earnings growth. The stock is up nearly 300% year to date, reflecting an extreme shift in investor sentiment. AMD took advantage of its soaring stock price in August when it announced that it was selling $600 million of new shares of its common stock, along with $700 million of 2.125% notes. The company planned to use the proceeds to knock down some of its debt, thus reducing its annual interest payments and making the path to profitability a little bit easier. AMD paid $160 million in interest payments in 2015. AMD now has $1.26 billion of cash on its balance sheet, and it has reduced its total debt to about $1.63 billion. The company's financial situation, precarious earlier this year, is now much stronger, giving it the resources to launch its new CPUs and GPUs next year. Existing investors were diluted by the stock sale, but they should be thrilled that AMD used the opportunity to raise cash. 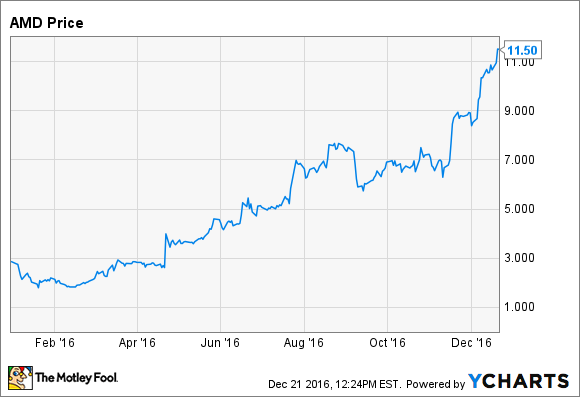 For those wanting to utilize graphics cards in the cloud, NVIDIA (NASDAQ:NVDA) has long been the only real option. Amazon Web Services, Microsoft Azure, and IBM Cloud all offer NVIDIA's Tesla GPUs exclusively. The company's focus over the past few years on deep learning and GPU compute has paid off. NVIDIA's data center business is nearing a $1 billion annual revenue run rate, with third-quarter sales nearly tripling year over year. AMD's GPUs aren't available on any of those platforms, and it's fallen far behind NVIDIA in the market for accelerators. An analyst at Nomura estimates that NVIDIA controls 80% of the accelerator market, with AMD and Intel fighting for the scraps. AMD made some headway in 2016. Alphabet's Google announced in November that it planned to offer AMD's FirePro GPUs through its cloud platform, along with NVIDIA's Tesla GPUs as well. While this is win for both AMD and NVIDIA, it narrows the gap a little between the two companies. AMD built on this momentum with the announcement of Radeon Instinct in December, the company's upcoming line of graphics cards built specifically for deep learning. The company is playing catch-up in this area, but the potential opportunity to accelerate A.I. workloads is significant. NVIDIA is still the undisputed leader in the accelerator market, but AMD made some noise in 2016.